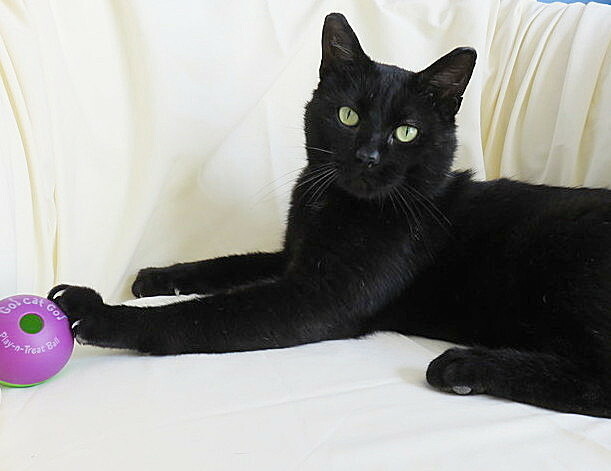 Merlin is an older kitten who survived the 2014 brutal winter outside – he somehow made it by being fed by a kind stranger and must have found a warm place to hide on the coldest days. Frostbite took the edges of his ears, but he is otherwise fine. Either abandoned or lost before winter, he was injured in early spring. After vet care and being taken in by a rescue, he came to our home to relearn indoor life until we can find him a home as wonderful as he is. Merlin is a perfect house-panther with only a few flecks of white. His gorgeous eyes morph from green to yellow – perfect for his magical name. He is gentle, sweet, and very social with both felines and humans. He has a fear of hands coming at him from the front – he’ll get over this with time and gentle guidance – we think it’s from a bad experience in his past. Here’s a Photo-Album of Merlin.